But an even bigger culprit, and one that is not often discussed, is inflammation. Basically what it’s saying is that inflammation causes bone to break down and inhibits it’s remodeling, or growth. This makes sense considering that post menopausal women are at risk. During menopause, estrogen levels drop significantly. When estrogen decreases, inflammation increases. This is a natural process, but when we take into account that inflammation is rampant and driven by modern lifestyles and diet, it’s easy to see how this excess can create a problem. Chronic inflammation, as we know, is also associated with conditions such as cancer, cardiovascular disease, brain disease, autoimmune disease, IBS and Diabetes. 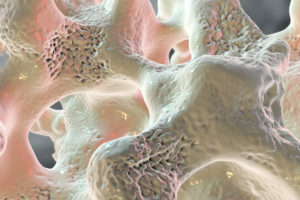 Worldwide, 1 in 3 women over age 50 will experience osteoporotic fractures, as will 1 in 5 men aged over 50. Prolonged use of corticosteroids is the most common cause of secondary osteoporosis. It is estimated that 30-50% of patients on long term corticosteroid therapy will experience fractures with an increased in risk of hip fracture by 2-fold in women and 2.6-fold in men. Physical inactivity and a sedentary lifestyle as well as impaired neuromuscular function (e.g., reduced muscle strength, impaired gait and balance) are risk factors for developing fragility fractures. Proton pump inhibiting drugs can reduce the absorption of calcium from the stomach and long term use of these drugs can significantly increase the risk of an osteoporosis-related fracture. Some young females, particularly those training for elite athletic competition, exercise too much, eat too little, and consequently experience amenorrhea which makes them at risk for low bone mass and fractures. Smoking can lead to lower bone density and higher risk of fracture and this risk increases with age. A high intake of alcohol confers a significant risk of future fracture (e.g., over 4 units of alcohol/day can double the risk of hip fracture). The risk of vertebral and hip fractures in men increases greatly with heavy alcohol intake, particularly with long term intake. Use of anxiolytics, sedatives, neuroleptics and antidepressants has been shown to increase risk of hip fracture. It’s also interesting to note that use of certain common medications can be a major contributor and risk factor for osteoporosis. For any questions regarding medications and potential side effects, always consult with your physician. As always, look at lifestyle first. Is your diet one that promotes inflammation? Are getting enough essential nutrients? Is your gut functioning properly and allowing you to absorb and use nutrients? Do you lead a sedentary or active lifestyle? Are you overtraining? Do you get enough rest? Are you taking medication that increases the risk of osteoporosis? You have the power to control inflammation, and therefore control or prevent the conditions it leads to. What changes can you make to better your odds and reduce your risk of suffering in the future? For more information on functional testing, finding and addressing the root causes of illness and optimizing your health with the latest science-based, natural and effective methods, visit http://www.viavitaehealth.com/. The information in this email is the opinion of Robert Inesta, DC, L.Ac, CFMP, CCSP of Westchester Sports and Wellness, DC, PC based on his research and experience. It is not intended to replace a one-on-one relationship with a qualified health care professional and is not intended as medical advice. Dr. Inesta encourages you to make your own health care decisions based upon your research and in partnership with a qualified health care professional. The information and products mentioned in this email are not intended to diagnose, treat, cure, or prevent any disease.